Among the many things über-chef Wolfgang Puck likes, there is coffee. His passion for the black drink led him to create a line of cold brewed iced coffees in 2009 with pastry chef Sherry Yard and Craig Lieberman, president of Woodway Beverage Partners. The trio has developed four flavors: Vanilla Fusion, Double Blend Mocha, Crème Caramel and Café au Lait. Made with certified organic ingredients, they are prepared using a cold-brewing process that reduces the tannins and the bitter taste often found in hot-brewed drinks. The results are delicate flavors at only 120 calories for an 8.5-ounce bottle, while other brands are around 250. 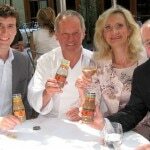 Watch my exclusive video with Wolfgang Puck talking about the drinks. Available in 35 states, the prices vary from $1.99 to $2.29 for a single bottle, and $6.49 to $7.99 for a four-pack depending on the outlet. For store locations, please visit the Wolf Gang Puck Iced Coffee official website. Consumption of iced coffee increased 6% from 2009 to 2010. If you’re one of its many fans, you might as well drink one that tastes good and is made from good ingredients. And, it’s even kosher! For more news about gourmet foods, visit the GAYOT.com Food section.